SAN DIEGO, CALIFORNIA – Scientists are a step closer to understanding what draws white sharks each spring to the “White Shark Café”, an offshore aggregation area halfway between Mexico and Hawaii in the Pacific. 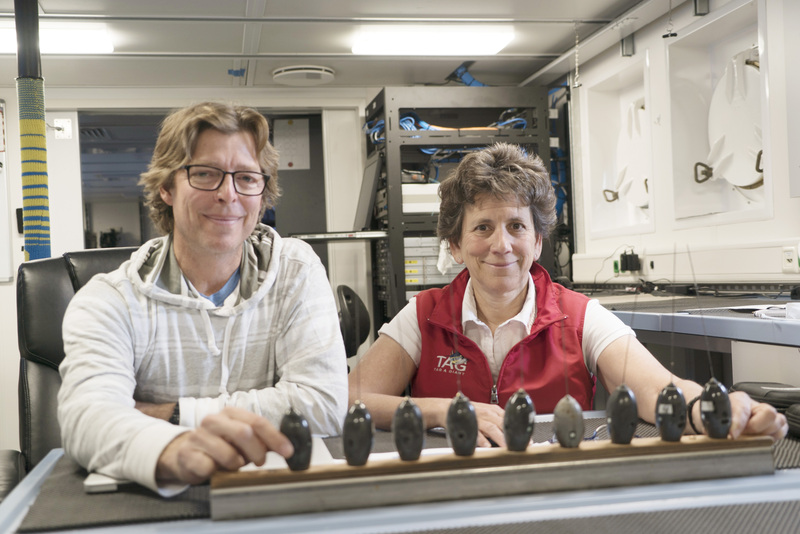 An interdisciplinary research team from five Institutions led by Stanford University Marine Biologist Dr. Barbara Block, has just completed a month-long expedition aboard Schmidt Ocean Institute’s research vessel Falkor. 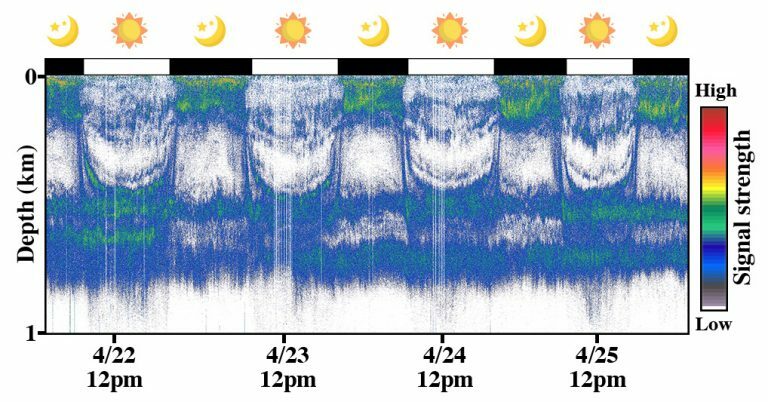 Using an array of cutting-edge and traditional oceanographic instruments, the scientists studied the Café ecosystem in unprecedented detail, yielding new insights into its appeal to these apex predators. The researchers tracked the sharks to the Café using pop-up satellite archival tags. These sophisticated biologging instruments were attached externally to 20 white sharks off the coast of central California in fall and winter, when the white sharks were feeding in nearshore waters. 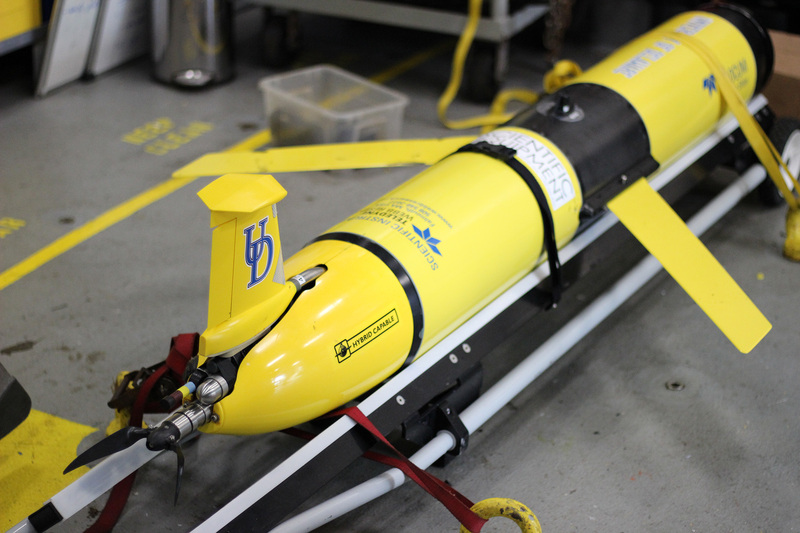 The tags were programmed to pop off the sharks while the Falkor was in the Café area, in hopes that they would help guide the researchers’ shipboard investigations of oceanography and the ecosystem. Once the tags surfaced and transmitted their position to Earth-orbiting satellites, the researchers recovered ten tags released from the sharks, 6 more transmitted their data sets and 2 popped outside the Café area. “It was a white shark treasure hunt” assisted by the Captain, the first officer and the white shark ecologists on board, said Dr. Sal Jorgensen of the Monterey Bay Aquarium, “We were able to pick up from the ocean these small tags loaded with high resolution data that will help reveal why the white sharks visit this oceanic ecosystem and their unique behaviors while here,” Jorgensen said. “We doubled the amount of data we have in just a few weeks.” The researchers had 18 positional only satellite tags attached to white sharks and 50% reported from areas in or close by the Café cruise area. The satellite archival tags log the depth and temperature of the water around the sharks every few seconds, and these high-resolution data enable much better understanding of the dive patterns of individual sharks in these deep oceanic waters, providing new insights to their behaviors in the Café waters. The tags also provided the focal points for the Falkor oceanographic surveys, which probed Café waters below the surface of the ocean where satellites cannot observe. “We compared a wide array of biological ocean observing tools to investigate how to census ocean ecosystems rapidly,” Block Said. “We found a high diversity of deep sea fish and squids (over 100 species), which in combination with observations made by the ROV and DNA sequencing, demonstrate a viable trophic pathway to support large pelagic organisms such as sharks and tunas.” The researchers caution that until they complete their analyses of the behaviors archived on the satellite tags, they will not know whether the sharks were feeding, mating or doing both during their time in the Cafe. 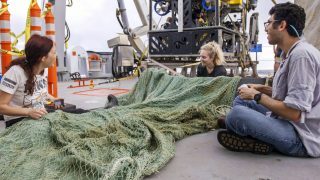 The team used traditional net tows to sample marine life from the “midwater” zone up to 1500 feet deep, while simultaneously targeting prey species with the ship’s echosounder and sequencing DNA from water samples to test for the presence of sharks and prey species. In addition, they conducted measurements of phytoplankton concentration, water chemistry and physics. In a pioneering first, the team successfully sequenced the DNA of white sharks shipboard in the open ocean waters near where the tags had popped free from the sharks. 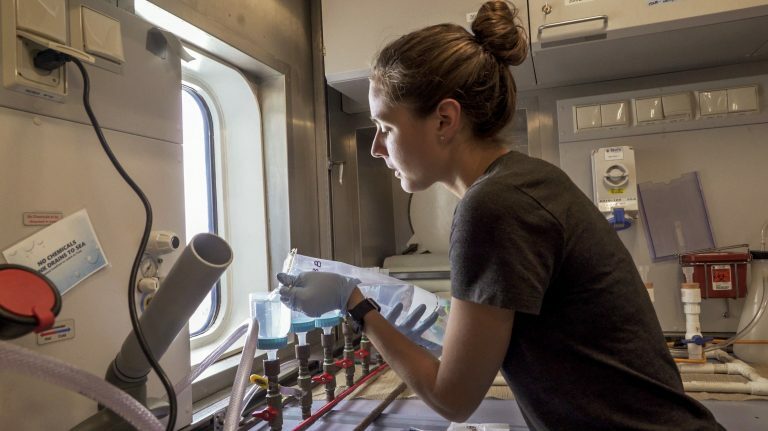 Stanford Ph.D Candidate Elizabeth (Eily) Andruszkiewicz processes water samples in order to extract and detect DNA from different vertebrates that have visited the Shark Cafe’s waters. Once the team zeroed in on the positions of the tagged sharks, they also deployed the Schmidt Ocean Institute’s remotely operated vehicle (ROV) SuBastian, to explore the Café ocean ecosystem down to the depth of 3000 feet. In a part of the ocean that no humans have ever visually surveyed, the team observed and filmed a surprisingly diverse animal community that included deep-sea fishes, squids and jellies. Along with the ROV, a free-swimming, torpedo-shaped robot called a Slocum Glider; and two wind-powered Saildrones expanded the study area and simultaneously conducted oceanographic and biological surveys of the environment. The Saildrones were deployed prior to the Falkor cruise and surveyed the White Shark Cafe area ahead of the ship’s arrival. The oceanographic data collected during the cruise suggests that in the Café region, small-scale eddies draw nutrients closer to the surface and enhance biological productivity in this region. These swirling masses of water help generate mixing, and promote ocean productivity below the surface, which has not previously been captured by satellite data in the region. 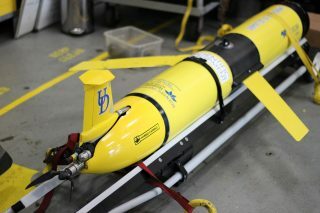 The Slocum Glider Autonomous Underwater Vehicle. “Because the chlorophyll concentration peaks deep in the water column,” explained Stanford University oceanographer Dr. Jan Witting, “it is not visible to satellites – leading us to believe this was an ocean desert.” Chlorophyll is an indicator of ocean productivity, and the team was able to track its distribution throughout the Café via shipboard sampling devices deployed over the side daily, as well as by using the autonomous Slocum Glider, which dove through the center of the Café area. 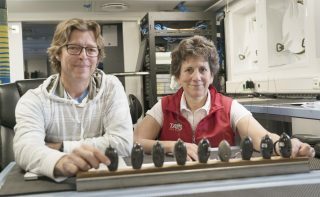 Dr. Sal Jorgensen and Dr. Barbara Block with some of the recovered satellite tags from the expedition. 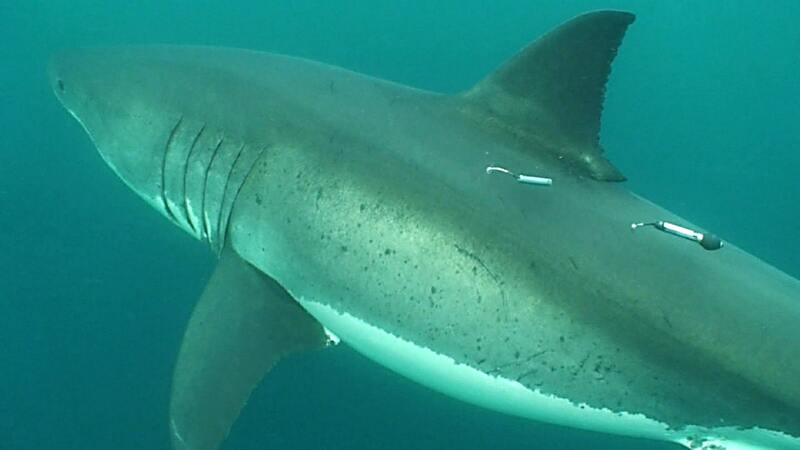 The research will enable the scientists to better understand why white sharks invest the energy to travel out to the Café area, and the reason these massive predators concentrate in an area where they may be vulnerable to high seas fisheries. You can learn more at the Schmidt Ocean Institute expedition page, as well as http://whitesharkcafe.org. 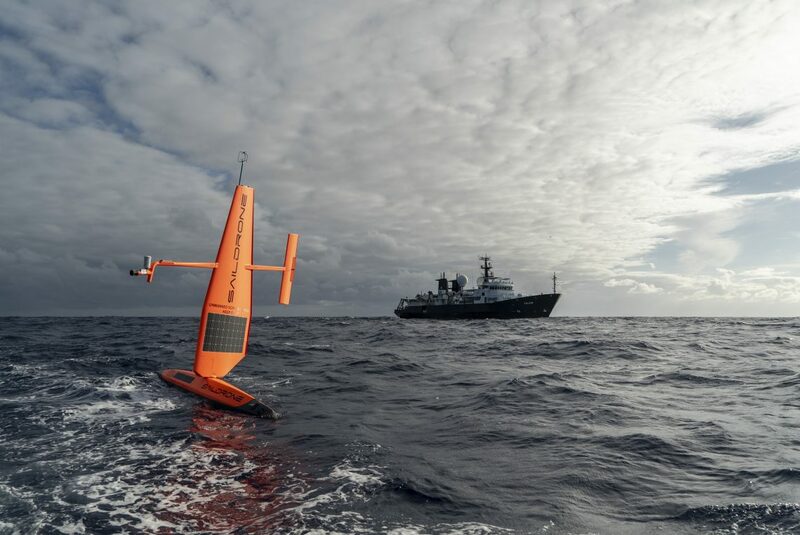 Other website resources include data from tagged sharks, and the robotic platforms Slocum glider and Saildrone data has been shared online in real time. Images from the expedition can be found here, and video can be found here.